Description- Aragonite is a soft mineral which occurs in radiating groups or in stalactite form. The crystals may be transparent to translucent. It may vary in color from white, yellowish, red-brown, or brown, however it has also been found on rare occasions in blue or violet. 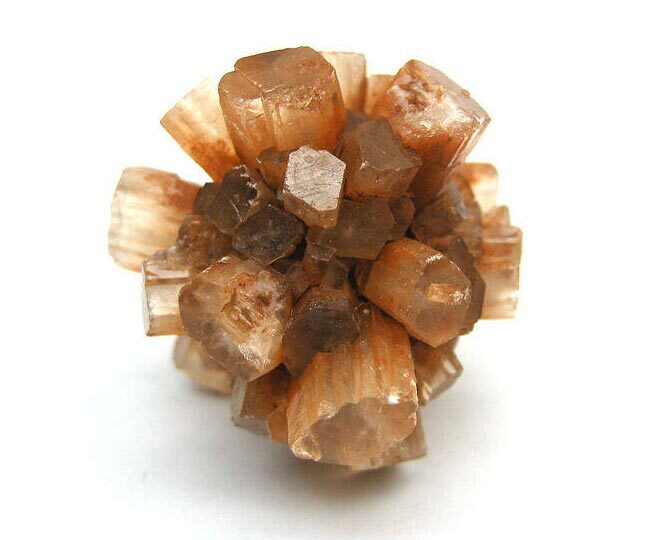 History-Aragonite was named after the province in Spain called Aragon where it was first discovered. Aragonite is found as a deposit with beds of gypsum near hot springs or in association with calcite in mineral veins. Location- It may be found in gem quality crystals in Czechoslovakia. It is also said to be located in Turkey, Spain, France, Morocco, Italy, England, Namibia, and in the U.S. it has been discovered in Colorado, New Mexico, Arizona, and South Dakota. Folklore- It is said to aide in deep, peaceful meditation and is noted to uplift emotional stress. It is saidto be an excellent groundig stone which fortifies strength, confidence, and energy. Care- Due to its fragile and unstable disposition it is rarely used in jewelry unless it is a more stable gemlike quality stone. The base is often formed in conjunction with calcite or gypsum so most mineral forms are too soft to use. It should be kept from cleansing products which contain ammonia which could weaken it or damage the exterior radiating form with pitting, scratches, or other exterior damage. Store separate from other gems, minerals, or jewelry items.